Is this water safe to drink? Photo: Paul Kirtley. We can’t tell whether fresh water it is safe to drink by looking at it. Unless, for example, the water is obviously stagnant, dirty or oily we cannot visually determine the presence of some of the potential contaminants. Even if the water looks clean, it may be contaminated. 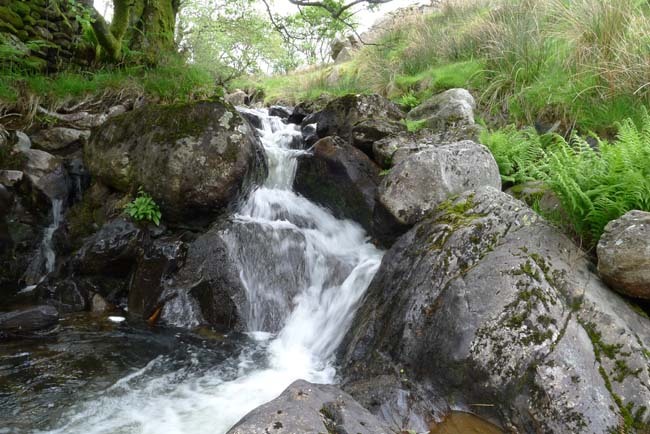 Over the years while leading people in the outdoors and teaching courses in wilderness skills, I’ve found that most uncertainty about how to treat water comes from a lack of clarity over what the problems might be. This is due, at least in part, to the marketing surrounding the many water-purification products aimed at the outdoors user. The better your understanding of the potential contaminants, the better equipped you will be in determining the solution. Don’t be baffled by scientific terminology or over-technical marketing hype. Turbidity: Turbid water is muddy, thick or cloudy. This can be due to sand, mud, silt or other suspended particulate matter such as decomposing organic material. Removal of turbidity is important. Even if there are no waterborne diseases present, turbid water can irritate your digestive system. In addition, turbidity can reduce the effectiveness of chemical treatments. Parasites are organisms that live in or on another organism, benefiting at the expense of the other. Waterborne parasites can be either multi-cellular organisms such as worms or simple, single-cell organisms such as protozoa. Protozoa are colourless microbial organisms, capable of motion. They obtain food by ingesting other organisms or organic particles. Protozoa lack the cell walls of algae and fungi and in this respect resemble animal cells. Many protozoa are free-living microorganisms, but several cause disease in humans and other animals. Protozoa are typically 0.01-0.05mm in diameter. 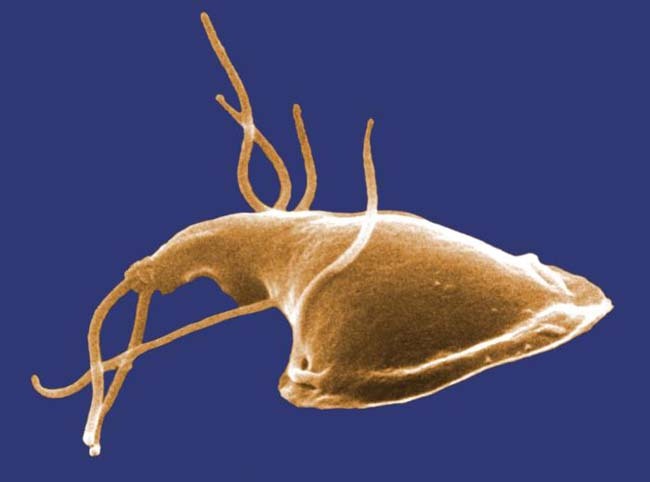 Examples include Cryptosporidium and Giardia. Bacteria are a large group of single-cell organisms, some of which cause disease, between them producing a wide range of infections, some of them potentially lethal. Bacteria are widely distributed in soil, water, air, and on, or in, the tissues of plants or animals. Bacteria were first observed in the 17th century and first definitely implicated in a disease (anthrax) in 1876. Typically a few micrometers across (micrometer or ‘micron’ is one millionth of a metre), bacteria are much smaller than protozoa. Examples of diseases caused by bacteria include Typhoid fever. 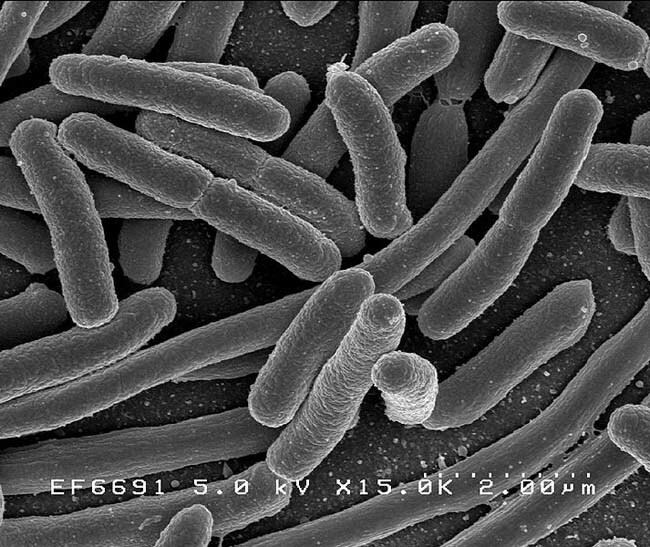 Scanning electron micrograph of Escherichia coli. Source: Rocky Mountain Laboratories, NIAID, NIH (via Wikipedia). Viruses are not cells. Viruses lack many of the attributes of cells. A single virus particle is a static structure, quite stable, and unable to change or replace its parts. Only when it is associated with a cell does a virus acquire a key attribute of a living system, reproduction. Many viruses cause disease in the organisms they infect. While protozoa are measured in terms of thousandths of a metre and bacteria are measured in millions of a metre, viruses are measured in terms of billions of a metre (nano). Many causes of ‘traveller’s diarrhoea’ are considered the result of infection by waterborne viruses. More serious diseases such as Hepatitis A and Polio have long been known to result from faecal contamination of water. Hepatitis A - Map of Prevalence. Source: CDC. Chemical pollutants can range from pesticides to heavy metals. Chemical pollution in wilderness areas and national parks are often associated with nearby mining, forestry and agriculture. A pathogenic organism is any organism that causes disease. That is, as far as waterborne disease is concerned, could be protozoa, bacteria or virus. Some microorganisms (such as Giardia lamblia) can form cysts, which allow the organism to live without food, water or oxygen for a period of time. The cyst protects the organism from harsh conditions, allowing it to be much more resistant to drying, heat, chemicals, mechanical disturbance such as crushing or vibration, UV and ionizing radiation than the unprotected organism. For parasitic species, the cyst will also enable it to survive outside of the host. The life cycle of Giardia. Source: CDC. In a wilderness or remote travel situation, it is unusual to have to deal with all five types of contaminant at the same time. Use common sense and research to find out what you are likely to be facing. We can see turbidity and it can be removed with coarse filtration. Dead fish and vegetation are clear signs of serious chemical pollution. Chemical pollution is often less extreme than this, however, and the signs much more subtle. With a little bit of pre-trip research we can judge if we are visiting an area where chemical pollutants may be an issue (for example will you be near sulphide mining, or is there a lot of agriculture up river?). The presence of waterborne pathogens is often associated with the presence of humans and domesticated animals (and their excreta contaminating the water). In many places where there has been little or no human activity and no livestock or pack animals, then the water can be free of pathogenic organisms and safe to drink. But remember we can’t know for sure without testing the water. Even if the locals drink the water, remember that they may well have been doing it for years and have an acquired immunity to pathogenic organisms we may never have encountered before. Pre-trip research will also help you determine which waterborne pathogens are possible, likely or endemic in the country you are travelling through. This type of research can easily be combined with determining which inoculations, if any, you require before a trip. There are methods of dealing with each of turbidity, parasites, bacteria, viruses and chemical pollutants. No single method, however, will provide satisfactory treatment for all of these contaminants. Further, there are many water purification products on the market which make use of some of these methods. This proliferation of products along with marketing tends to create some confusion amongst potential users as to which method is “best”. The best solution depends on the circumstances. In future articles I will look at the various methods in more detail, including pros and cons and tips for application. The author using a water purification pump that combines filtration and chemical treatment. Photo: Amanda Quaine. Here, I’ve gone back to first principles. Some chemical treatments (chlorine, iodine) will kill many pathogenic organisms (in particular bacteria and viruses), while other treatments (chlorine dioxide) will deactivate all of them. Hence, you will be able to deduce that a combination of filtration and a suitable chemical treatment or boiling will deal with any or all of the specific contaminants. If you understand these fundamental principles, then you can start to make an informed judgement, free from the influence of marketing, and adopt a solution that best fits the circumstances. The details and pros and cons of various methods will be covered in future articles. Once again an interesting article, thanks! In most “survival shows” they just boil the water to make it safe to drink, but I never quite understood when one knows for sure if boiled water is safe to drink (short of obvious chemical sings). So for your next article, I’d like to know which possible contaminations boiling water will remove. I’m also interested to know if distilling water is always safe. I’ve read somewhere that drinking too much distilled water can actually be harmful. Is this true? Anyway, looking forward to the follow-up article. Yes – well written and informative as always. Glad you found the article useful. I will be covering boiling in a future article and will certainly address the points you make in your comment. Regarding distilled water – you won’t be able to distil water to the level of laboratory distilled water with basic camping equipment, so I don’t think it is an issue you need to worry about. There is plenty of ignorance and confusion amongst the outdoor community around this subject and definitive factual discussions such as this are very helpful. Once we can understand the scope of a problem it becomes easier to understand how to best to respond. I’m looking forward to the follow up article on how to deal with the contaminants you’ve identified Paul. I’ve been intrigued by the more recent developments in portable water treatment devices which use UV light to destroy pathogens, or at least to mitigate their harmful effects, and wonder if you’ll be able to assess these in the next article alongside the more traditional methods. Thanks for the comment. I will touch on UV light although personally I don’t favour it because it either depends on batteries or moving parts. Also, one of the issues is it requires clear water to work properly. Chlorine desinfection does not work effective for cryptosporidium (3-6 micon), giarda (4-15 micron) and some ecoli type bacteria (some became recently resistent). Besides Active Carbon (mostly made of coconutshells) a new type has become available named Nano Carbon (NMC). I am studying waterfilters for almost 2 years now and the information about waterfiltration devices is very hard to find. (the real important info!). Yes, halide disinfection is not effective against Cryptosporidium cysts, in particular. I’ll expand on this in future articles. Agreed! – It is not easy to find good (and consistent) information on water filters. Another great article, I really look forward to receiving your invite to view e-mails. Valuable and important information that I know I can rely on. It’s been a while. Nice to hear from you. Thanks for your comment and letting me know you are finding this material useful. Looking forward to catching up with you this weekend, I understand that this topic is on the agenda. I’m going to bring my purification kit with me, and welcome your thoughts. I think it’s true that marketing can cloud peoples judgements of what is useful and effective. Yes, it’ll be good to see you this weekend. Looking forward to it! It has been proven many times over that anywhere on earth, even on Mount Everest, once water reaches the boiling point ALL disease causing organisms have either been destroyed or rendered inert.- the water is hot enough. No need to boil for even 5 seconds. Actually, even before the boiling point has been reached the water is safe to drink- but we typically let it start bubbling as proof it is hot enough (since we likely do not have a thermometer). However, chemical contamination is generally not solved by heating water. That requires filters and other techniques. Yep, all of that is covered in the article. * Some chemical treatments (chlorine, iodine) will kill many pathogenic organisms (in particular bacteria and viruses), while other treatments (chlorine dioxide) will deactivate all of them. So, I’m not quite sure what your point is: Are you suggesting that the only technique you ever have to employ is boiling? turbidity still needs to be reduced beforehand to ensure effective dose. Must admit I have never heard of ‘Turbid water’…! You learn something every day eh. You also cover each point very well which makes it very interesting. Looking forward to reading more in your future articles. I would like to know how long water will keep for. I intend to keep water in my car with other survival equipment in case of an emergency. It would be in a 58 pattern bottle. Thanks for a great site and keep up the good work. The answer is it depends on how clean the water is in the first place. Plus what temperature it will be stored at. To maximise the length of time the water will last, you should definitely sterilise the bottle first. Then add tap water and 1 chlorine water sterilisation tablet. This will allow the water to stay safe for up to six months. Put a label on the bottle with the date you bottled it and add a note in your diary to change the water. Many people have no idea that which contaminates are available in water and I think we should know these contaminates which are you mentioned in your post, thanks for sharing the informative information. Good, common sense article, as always. However, I would like to take issue with one statement: “In many places where there has been little or no human activity and no livestock or pack animals, then the water can be free of pathogenic organisms and safe to drink.” Many parasites are also harboured by wild animals, and indeed some may be more common in wild animals than domesticated. As a non-water example deer in the UK harbour many more ticks than either sheep or cattle. I would always suggest at least boiling/filtering/treating water for pathogens before drinking. I’m sure many of us (me included) have risked it and not had an issue, but even mild diarrhoea can ruin any break away from home! I have a question though, I wonder what to do with water that has algae. Algae in themselves are often poisonous, but I have heard that they also can leave poisonous byproducts in water. I guess that the algae can be filtered out (as with turbid water), but will the water be safe to drink after boiling? Hi Paul, thank you for this useful article. Am looking forward to the next instalment when you go into deeper analysis of the various ways of treating water to make it safe. This will come in handy for my long distance hikes and wild camping. What do you think about Lifestraws etc? Just for emergencies? Your post is very interesting, the information is very useful. After reading your post, I’ll find other information about water purification. The topic is very great. Thanks for sharing! Have now looked at how and why to make water safe to drink. their water was not treated. Even the rain is not pure anymore has oils in it. Excellent article Paul, as usual. A concerns of mine as well is that most people use plastics to contain their water, and still, some adventurists have dared boil their water in plastic containers. Plastics leach toxins into the water, especially at elevated temperatures, or even at extended periods of time. I know weight is an issue, but perhaps the containers should be considered as well in regards to potable water. Dear Paul,thank you for the latest blog, I found it very informative.I look forward to news on a suitable portable water purifiers,which treat all water contaminants. Thanks,keep up the good work. A quick question. My ‘wilderness’ camping is generally fairly tame- Sussex!- but there is no drinkable water other than that provided by woodland owners (only drinkable once boiled) or what we can take in ourselves. I do carry potassium permanganate though, which I understand can help sterilise water (with the advantage of being pink/purple so visible in your supply) , create a wound wash, dye snow purple for rescue after those Sussex avalanches, as well as fun fire starting with glycerin. Surely a multi-functional steriliser is worth a mention? Or is there a reason you would not recommend it? On the subject of boiling water and altitude, water boiling at a lower temperature that sea, are you supposed to boil longer for 500 feet drop the boiling temp by 1 degree so boil for 1 minute longer for every 1000 feet. Another great article. I’m an environmental health officer having worked with the military and in the disaster healthcare world in the WASH(water, sanitation and hygiene) areas for a number of years. Your article is very informative and quite right. 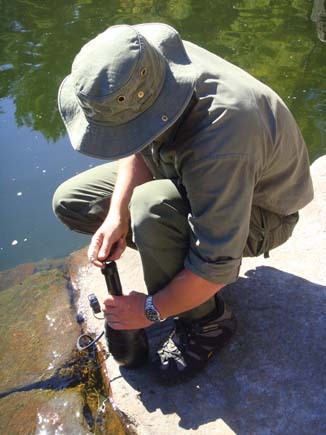 However you have missed a cheap and simple method of dealing with turbidity and suspended solids and that is Sedimentation, If you leave turbid water standing for a period of time(will depend on the size of the suspended solid) it will normally settle out at the bottom – a rain water puddle undisturbed will be clear at the top until you stir it up and re-suspend the contamination. Other alternatives for personal use are the Milbank Bag a canvas bag developed by the Royal Army Medical Corps to filter contaminated water – simple but it still works and home made small gravity sand filters, I have made them using tin cans and plastic 2 litre drinks bottles, I have also seen them made using a polythene bag filled with graded sand. You have mentioned the main ways of dealing with chemical contamination although some of the petrochemical contaminants will flash off when you boil the water. Another alternative for sterilisation that uses no chemicals or expensive equipment (but be mindful that there is no residual sterilisation capability should the water become recontaminated) is SODIS or solar distillation, Please see http://www.sodis.ch/methode/anwendung/index_EN. I have used this method in many parts of the world including Africa and Nepal, where it works very well. The key is making sure the water is as clear as possible and that the bottle is not scratched or damaged as this will reduce the ability of the suns rays to penetrate the water being sterilised. I look forward to you next article. We have no idea that above written contaminates are available in water. Thanks for sharing the contaminates that I think everyone should know. hi paul love your articles and videos. these days im into prepping and bushcraft. but when i was a single parent we were often without water due to many circunstances. always chech up stream for any dead animals. once we were without water due to a storm. i went to a stream and found it full if dead chickens in the stream and hanging from the trees. the nearby farmer was dumping all his dead and diseased chicks. have to say i took the courage and next time he left the sacks in the field. i spread them all over the field to let hom know. thanks again for all your time and advice. kindest regards janet. This is a really handy guide, Perfect for winter and summer camping. Useful information about water contaminants such as: Turbidity, Parasites, Bacteria, Viruses, and Chemical pollutants. With all the different tricks and types of filters and things we have to use to purify water nowadays, I have to wonder how in the world people managed to purify water before all of these things were invented. Has water become more dirty than it used to be? We just installed the AquaOx. It’s a whole house filter that removes nearly all contaminates. Love not having the chlorine smell and not having to always run the distiller. Double checking though that it removes fluoride. Thanks for the information about water filters. Now that I know there is chlorine, heavy metals, bacteria, and who knows what else in my water, I want a filter. I really like the idea of a ceramic filter. A well written and informative piece put in a understandable way, I certainly will be looking at water in a different mind set taking in to account all those factors you mentioned. I would like to put together a water purification class for my adventure club here in Indiana, USA. I believe the task of water purification is many times taken too lightly and I would (with your permission) like to use key parts of your tutorial for the class which we would target our trip leaders. I like the way you have approached the subject and your information is very clear and logical. Yes, please do use key parts of this tutorial to help educate. All I ask is you credit the source as a help and make a recommendation to your leaders to have a look at my site. I’m sure there are many things here that would be interesting and/or useful to them.